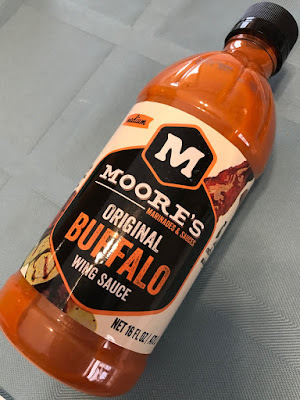 Chicago Foodie Sisters recently received a bottle of Moore's Marinades & Sauces to try out. There are nine different varieties and we tried out the Original Buffalo Wing Sauce. Since I had the "marinade" part of it stuck in my head, I figured I'd use it to marinate some chicken. It wasn't until after they were in the oven that I noticed it was wing "sauce" rather than marinade that was meant for tossing at the end. But it was an accident that was a success. 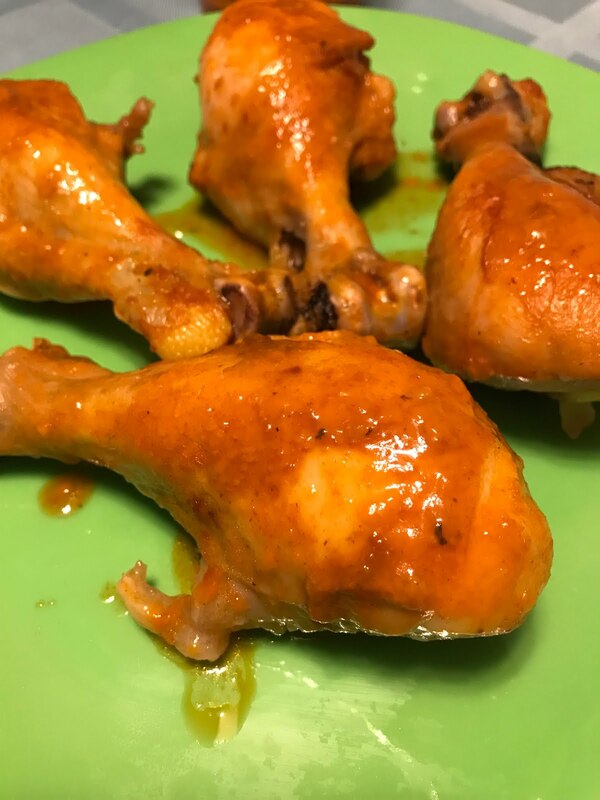 My hubby and boys prefer drums over wings, so I let some drums marinate in about 2/3 of the bottle for the afternoon in the refrigerator. After about 6 or 7 hours, I placed them in a baking dish, poured over the remaining sauce that it had been marinating in and baked for about 40 minutes. Spooned the sauce over the top and served it with a little extra sauce for dipping along with some ranch. 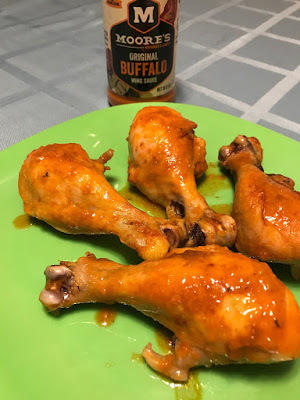 I am a bit of a wimp with hot stuff, so I did a few bites and it's all I could handle, but I must say it had great flavor even though it was too hot for my delicate taste buds. :) It was one of those times my mouth was on fire, but I didn't want to stop. It wasn't all fire and no taste, it was a perfect combo of heat and flavor. The guys in my house love hot stuff and one bite in my husband was loving it and going on and on about how good it was. I've already got plans for some chicken dip using what's left in the bottle. You'll find Moore's in a number of grocery stores and department stores in the area, including Walmart, Meijer and Target. Click here for a complete list of retailers. You'll also find a great variety of recipes at mooresmarinade.com. ***Chicago Foodie Sisters received a product sample for the purpose of a review. We were not compensated for this post. All opinions are our own.